What is the short version of how a procurement transformation will improve my variable and fixed costs? A procurement transformation effort can reduce your costs significantly. For a typical implementation, you will see annual cost savings of 4 to 9% on your services and materials spend. You will also capture fixed cost savings of 20 to 30%. With normal program execution costs equal to 1 to 2% of one year of spend, depending on your organization’s size and current capabilities, most procurement organizations will break even during the third year of program execution. 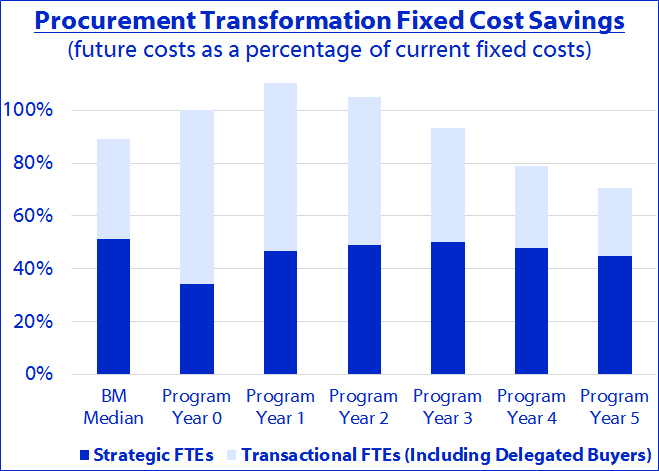 Click here to see a sample Procurement Transformation Value Report. Variable Cost Savings Summary –The greatest value for a procurement transformation effort is achieved through improved strategic sourcing capability. 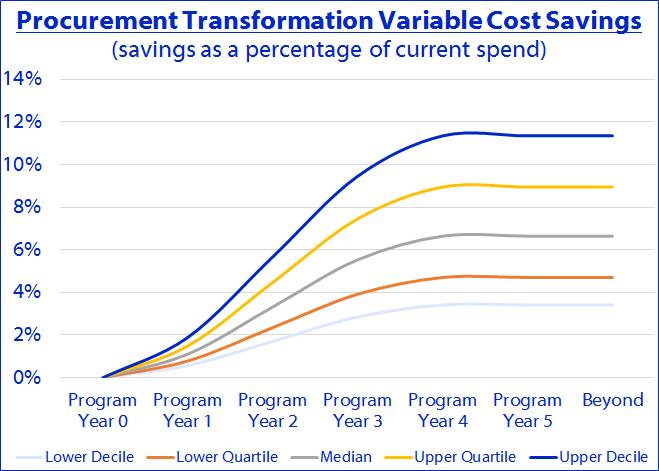 Median savings for these programs run just above 6% of spend, with upper quartile executions delivering about 9%, and lower quartile projects saving about 4%. Even at the low end of this range the cumulative discounted cash flow will be positive during the fourth year of your program.Savings on services typically run higher than on direct materials as most companies have already moved to get this direct materials spend under a strategic sourcing program. Your savings will be higher if you can get additional value in all spend areas. Fixed Cost Savings Summary –Cost savings from building out effective processes, systems and organizations to support your program, while smaller than the anticipated strategic sourcing savings, are still sizable at 20-30% of current fixed costs. This is the result of significant reductions in transactional workload for procurement and its internal clients, offset by moderate increases in strategic sourcing personnel costs. While these savings are not as large as the variable cost savings, it is more important to understand that at least 25% of the variable cost savings will be lost if this part of the program is dropped. Without effective systems, organizations cannot fully understand their spend profile and will get significant contract leakage.